Oct. 29, 2018 – A good scare is good fun on Halloween, but not when it comes to safe driving and child pedestrian safety. Children are more than twice as likely to be hit by a car and killed on Halloween than any other day of the year, according to Safe Kids Worldwide. Excited trick-or-treaters often forget about safety, so drivers, party-goers and parents must be even more alert, AAA Oklahoma’s Leslie Gamble, public affairs manager, cautions. The National Highway Traffic Safety Administration (NHTSA) reports that Halloween is consistently one of the top three days of the year for pedestrian injuries and fatalities. Tragically, Halloween drunk-driving fatalities are on the rise. From 2012-16 there were 168 drunk driving fatalities nationwide on Halloween night. During that period 44 percent of all people killed in motor vehicle crashes on Halloween night were in crashes involving a drunk driver, according to NHTSA statistics. Children out trick-or-treating and those accompanying them are also at risk, as 14 percent of pedestrian fatalities on Halloween night involved drunk drivers. Younger people are most at risk: The 21- to 34-year-old age group accounted for the most fatalities (46 percent) in drunk-driving crashes on Halloween night in 2016. Buckle your seatbelt and make sure all passengers are buckled as well. Bulky costumes and frequent stops are no excuse for using the best protection you have from injury while in a vehicle. Put your phone down while behind the wheel, so you can focus on the road and trick-or-treaters. Slow down in residential neighborhoods and obey all traffic signs and signals. Drive at least 5 mph below the posted speed limit to give yourself extra time to react to children who may dart into the street. Look for children crossing the street. They may not be paying attention to traffic and may cross the street mid-block or between parked cars. Carefully enter and exit driveways and alleys, taking extra care if you are backing up or turning. Turn your headlights on to make yourself more visible – even in the daylight. Broaden your scanning by looking for children left and right into yards and on front porches. Make sure Halloween costumes are flame-retardant and light in color to improve visibility. Be bright at night – have trick-or-treaters use glow sticks or wear retro-reflective tape on costumes and on treat buckets. Ensure that disguises don’t obstruct vision, and avoid facemasks. Instead, use nontoxic face paint. Also, watch the length of billowy costumes to help avoid tripping. Ensure any props are flexible and blunt-tipped to avoid injury from tripping or horseplay. Ask an adult or older child to supervise children under age 12. Instruct children to travel only in familiar areas and along established routes. Teach children to stop only at well-lit houses and to never to enter a stranger’s home or garage. 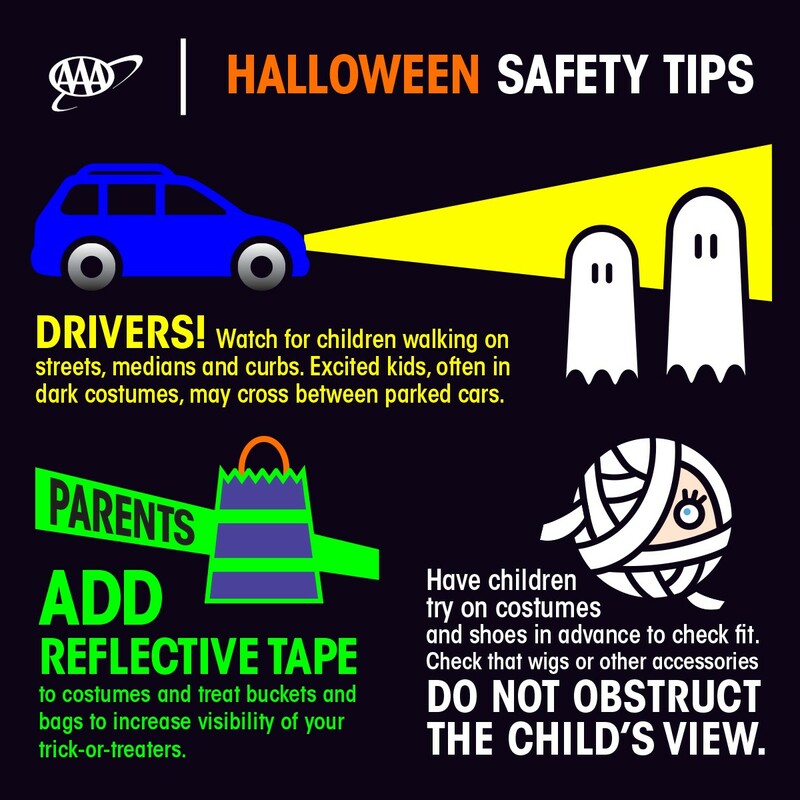 Review trick-or-treating safety precautions, including pedestrian and traffic safety rules. Stay on sidewalks and avoid walking in streets if possible. If there are no sidewalks, walk on the left side of the road, facing traffic. Look both ways and listen for traffic before crossing the street. Watch for cars turning or backing up. Cross streets only at the corner, using traffic signals and crosswalks, and never cross between parked vehicles or mid-block. Trick-or-treat in a group if someone older cannot go with you. Tell your parents where you are going. Carry a flashlight containing fresh batteries. Never shine flashlights into the eyes of oncoming drivers. Plan ahead for a safe ride home and/or designate a driver before partaking in any festivities. Always designate a sober driver; take a ride share or taxi; call a sober friend or family member. Before leaving for a party, load ride share apps or put numbers of local cab companies or your designated driver(s) into your phone. Walking impaired can be as dangerous as drunk driving. Designate a sober friend to walk you home. If you see a drunk driver on the road, contact local law enforcement. If you know someone who is about to drive or ride impaired, take their keys and help them make safe travel arrangements to where they are going. In Your Car When Severe Weather Strikes?